Now that it's sometime in October, is there any word on a race schedule for CCS? Do you have a link for live results from tomorrow's Rough Rider meet? How about the Mariner Invitational results? Cooper Teare ran 14:54 to win. Haskell of miramonte won var girls. 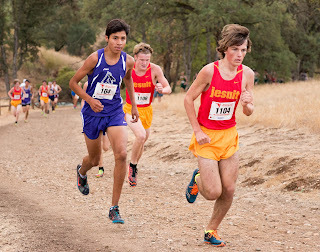 Grijalva threw down an impressive 15:35 at the Bella Vista Bronco Invite which is run at the brutal Willow Hill course, that time would have won sections the last few years. Holland of Jesuit was the only other runner to go sub-16. Jesuit went 1( Grijalva ran as an individual), 3,4, 7, 19 and were without Kurdy (5th in D1 state last year) who was on a college visit. Does the Mariner Invite have the same course as NCS at Hayward High? Yes, same course. I was told the course was very fast today. Another TOP performance by Cooper Teare! Another sub-15 compared to his 2nd place finish last year @ 15:16.08. Impressive!! Ramona is an awesome coach. Post 4:47, Yes St Francis is a good team, your course is short and fast and those times are just ok. Quite a few teams will post either the same or faster. Past history shows a lot faster times over the years. The course record is 14:32 with quite a few boys under 15 minutes over the years. As History proves. you still need to Get through SV, SLV and or even Aptos who show up at the end. But to be more realistic you don't have a 5th guy and looking over the results the last few weeks it looks like you beat SLV by 1 but SLV missing varsity runner, You lost to SV by 1 point, You beat Aptos and they don't have depth. SLV beat SV without SLV #2 runner. Both SV and SLV have 10 guys better than your 5th. So when you add in more schools to it the chances are either SV or SLV. Your League championships will be very interesting and it is great to see your program move up. But to be honest I look at History and Aptos, SLV and SV have history. Post 4:47 and Post 7:13. You are both right, but by going by Crystal springs invite results, one on one. SLV 24 SF 31, SF 23 SV 32, SF 21 Aptos 34. 1st I think SV just had a bad day at Crystal so expect them to step up. 2nd Aptos is just down. SLV has depth. SV and SLV would be the teams, so you will have to go after them both. The Mariner invite was run in perfect weather from what I hear, but it sounds as though a lot of Bay Area races had the same good fortune today. Albert, what are your thoughts on how these (Mariner) performances translate to the rest of the season? Kate Bowen - 8th grade - third in the open race at the Bronco Invite in 21:58 over 6K. That time beats her older sister's time of 22:15 at the same race two years ago, when Rylee was an 8th grader and won the open race. I meant to look for her name in the results since her sister did the same race two years ago. 5:54 pace for 6k as an 8th grader. As a high school coach, I would be impressed if a boy did that as a middle schooler. Yes, that's a good time. But what jersey did she wear? Mariner Invite results are messed up. Kids were left out of results and some were placed in the results under the wrong name. Impressive results for the top girls in the Mariner Invitational Varsity Girls race. Some young talent showing up in a big way. Can we count on this latest posted Mariner's results as official and final? I noticed a lot of changes for the team and individual results (new names, new standings, etc)from the initial version I saw earlier? It looks like some teams/individuals might still be missing or incorrectly reported. I don't see St mary's from the VG team standings although the individual runners are shown. Looks correct to me. St. Mary's only ran 4 girls in that race and had the rest of their varsity run the JV race, so that's why they're not scored. Varsity girls to win the JV race and 'sacrifice' the Varsity race. I thought it was interesting that Davis didn't run their varsity teams at Bronco, with a chance to run the Willow Hill course before league and sections. Understand they are still running Mt. Sac. Davis never runs the Varsity squad at Bronco.